Ornamental floors have become an increasingly popular choice for many consumers who want to customize their homes. Here at TheWoodFloorStore.com we offer a wide variety of high quality hand crafted Parquet Designs. These designs are some of the basic designs that we offer but upon request we can customize any design a customer has. Designs are only limited to the customers imagination. When considering what type of Parquet to install it is a good idea to think about layout,material, and overall design of the room. Installing Parquet Patterns are difficult and should be performed by qualified professionals. 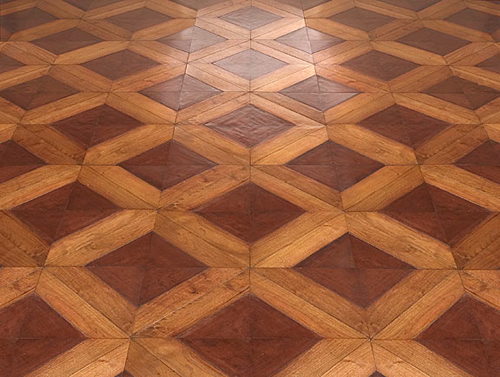 Many people think that large-scale parquet patterns are the most beautiful of all floors. Proper miling, installation, and finishing of these large patterns can yield stunning results, particularly in large rooms. Here at thewoodflooringstore.com we offer a wide variety of prefabricated parquet patterns that will transform any room into a work or art.